Waxed Canvas Tool Rolls are now available!!! Finally!!! After almost 9 months of testing numerous ideas, concepts and configurations, we have produced a Waxed Canvas Tool Roll that not only meets, but exceeds our high standards. You can now store and protect your prized chisels and carving tools in style. Future configurations and applications are already being explored. This is a sure fire design that will work across numerous trades and disciplines. We are really excited about some of the possibilities! 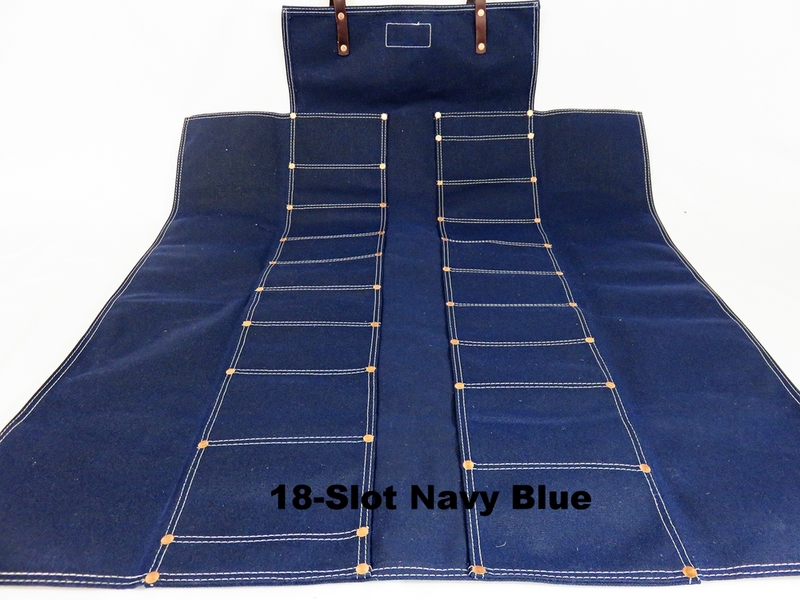 They are available in both 12-slot and 18-slot arrangements and in four colors initially. The pockets on each side are staggered, allowing the tools to nestle in between each other for secure and safe transport. The rivets are installed with the smooth side facing inwards, keeping any contact between ferrules and handles to a minimum. The pockets are 5" deep and will comfortably fit tools up to 12" in length. Double stitched seams not only look nice, they are used specifically to hold up to the daily rigors of shop life. With proper care and use, these rolls should last a lifetime. You can refresh the wax treatment with Martexin Refinishing Compound, available in our General Store. All it takes is a little heat and some elbow grease and your waxed canvas will be good as new! Both the 12-slot and 18-slot rolls have four large pockets that measure 3" across, roomy enough for a dowel plate, spare plane blade, or the largest "pig sticker" English Mortise chisel you can find. The remaining slots are 2 1/8" wide, fitting most chisels and carving tools commonly used. Don't limit the use of these rolls strictly to chisels and carving tools. Dividers and calipers, marking gauges, folding rulers, scissors and more can be safely stored. There are even two slim pockets on each side that can accommodate a pencil or a six inch rule. These purpose of these slim pockets are to establish the staggered layout, they just happen to be handy for other things as well! Though the waxed canvas is durable, it can still be damaged by a sharp blade. Protective covers are highly recommended for all tools stored in these rolls. There are numerous tutorials available online for making your own custom covers, including this article I wrote for Furniture and Cabinetmaking magazine. As an added bonus, you can now choose what type of rivet finish you would like to have, Smooth or Hammered. While neither style offers a physical advantage over the other, there is a distinct aesthetic appeal to each that you can now decide on. The outer flaps fold over and protect your tools both from accidental contact with each other and from falling out during transport. Two leather straps are secured with copper rivets and offer infinite adjustability, keeping your tools snug and secure. I have a few in stock right now of each size and color. Once those are gone, we will start making them as quickly as our soon to be born third son allows! There will be a 4-6 week turnaround on any rolls that are not in stock.